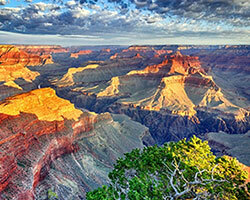 The amazing west rim of the Grand Canyon is only a few hours away from Las Vegas! Visit the world famous SKYWALK overlooking millions of years of geological history. Enjoy the desert beauty stopping at the wonderful Hoover Dam along the way. 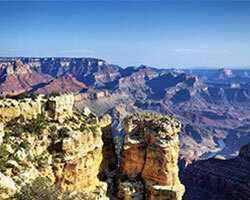 Our Las Vegas limo tour gives you spectacular views of the natural beauty of the Southwest. The Skywalk, managed by the Hualapai Tribe and located on tribal lands, consists of a horseshoe shaped steel frame with glass floor and sides that projects about 70 feet from the canyon rim. While the Skywalk is the most famous attraction at Grand Canyon West, tours also include other points of interest and unique canyon views. The Hualapai (WALL-uh-pie), the "People of the Tall Pines," have lived in the Southwest for untold generations. Traditionally their homelands stretched from Grand Canyon to the Bill Williams River in west-central Arizona and from the Black Mountains bordering the Colorado River to the San Francisco Peaks. Primarily nomadic hunter-gathers, they also traded with nearby tribes. The Hualapai Reservation of just less than 1,000,000 acres (404.868 ha) was established in 1883. Note: This tour has a maximum 10 hours in duration starting from your hotel. 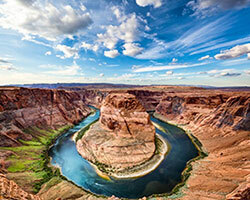 This tour will stop at the Hoover Dam for a 15 minute photo and then stop again for 2 hours at the Grand Canyon Skywalk. There are no additional stops. If more time is needed then we will charge in 30 minute increments. Tour schedules start at 8am. Rates include fuel surcharges but not chauffeur gratuity.